Start flower seeds indoors to have seedlings to transplant. Accurate seed preparation by timing flower seed development offers a head start to gardening outside. 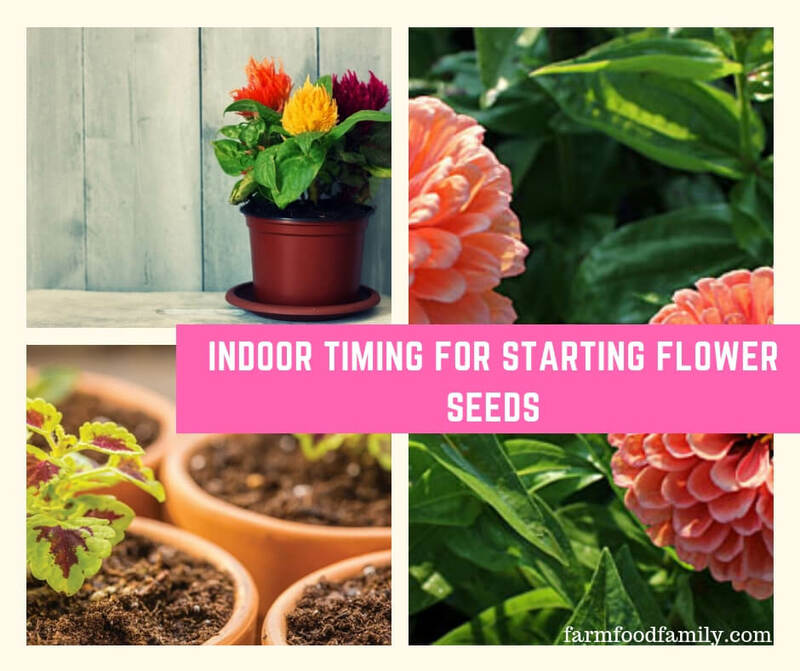 Timing is essential to take maximum advantage of starting seeds indoors. Gardeners can use several strategies to determine when to plant seeds indoors and hardening off seedlings, thereby readying transplants for a flower garden as the weather warms. Whichever calculation is used, the instructions on the back of the seed packet should always be followed for those specific flower seeds. In early spring, gardeners can use a number of ways to determine when to start their seeds indoors. The simple calculation of counting backwards the number of weeks a seed needs to grow into a seedling; from the last frost date in a gardener’s region is the most accurate. The United States Department of Agriculture hardiness zone in the region is another measure to use. The average annual minimum temperature of a region determines a hardiness zone. Zone 1 – 4 begins mid through late March. Zone 5 starts early March. Zone 6 begins late February. Zone 7 starts now, middle of February. Zones 8, 9 and 10 seeds can be started already. Another measure from which to count back is from the first frost-free date of a region. This is the date cold-weather gardeners use to safely plant outside tender perennials, annuals and warm season vegetables. This is a date that is much later than the last frost date, however it ensures no late season frosts will damage seedlings moved outside. All transplants should be hardened off before planting the flowers in a garden. Hardening off means gradually putting the transplants outside on nice days then moving them indoors, when it gets cold. Warm season plants are the most susceptible to being planted in the ground too early in the season. There are a wide variety of flowers that can be started from seeds indoors. For many gardeners, growing plants from seed is rewarding and the fun part of gardening, it is also very economical. But if there is limited indoor space, first choose plants that take a long time to mature. Geranium seeds need the extra time indoors to germinate, in contrast sunflower seeds take only 4 – 6 weeks and zinnia and marigold seeds can be planted directly in an outside garden. Generally, flowers such as Celosia, Cleome, Nicotiana and forget-me-nots take 6 weeks to grow. Coreopsis, Gaillardia and Statice take 8 weeks and Dianthus, Lobelia, Salvia and Viola take between 10 – 12 weeks to germinate. Some gardeners, at the end of the growing season, harvest flower seeds to save for the following year. Knowing which will be viable and how to store them will ensure more successful gardening. While seed companies have improved development in maintaining longer lasting seeds, gardeners still like to harvest their own, too. Therefore, it is worth understanding how F1 and OP labeling, seen with plant names and on seed packets, impacts success growing plants. F1 indicates that the plant is a hybrid. The hybrid was inbred to produce a new variety that will, in some way, be better than the parents. Unfortunately, saved seed from the F1 hybrid plant will not produce seed that will grow true and replicate for the gardener the same hybrid plant. OP means the plant was open pollinated. Gardeners are able to grow the plant, save seed knowing it will grow true to the original variety. Starting seeds is an economical way to have a flower garden and for many gardeners a fun hobby. But starting seeds in advance of warm weather takes advantage of time indoors, before getting outside to garden.